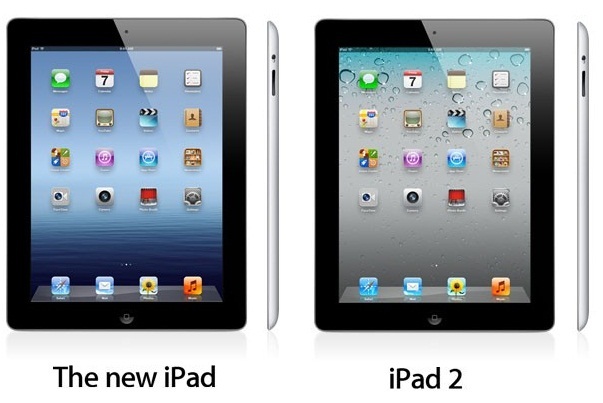 The all new iPad from Apple was officially announced on 7th March 2012 and will be available to the US consumers beginning 16th March 2012. As always, they did not continue with the numbering sequence, instead they called it just iPad and for now, we'll call it the New iPad. The typing error is intentional; it was meant for a revolutionary-high-resolution display. The new iPad is packed with stunning Retina display and probably making it the most pixel-packed tablet on the market. The screen size is similar to the iPad2 but packed with 3.1 million pixels in a 2048 x 1536 arrangement; claimed to have great improvement in color saturation. Although only 5 mega pixel, the iSight camera is similar to the one fitted inside the iPhone 4S, with backside illumination sensor. If it is as good as the one in the 4S, then I will be the first to agree that the images captured are quite decent. I own a couple of compact cameras, a D90 and a D700 DSLR. The iPad lens assembly has five elements in it to capture the best possible image, and it is claimed to be capable of capturing 1080p HD video. The new iPad boasts 21 mega bits per second (Mbps) HSPA+, with LTE radio capable of 73Mbps downlink on both AT&T and Verizon in the US, the home of Apple. In Malaysia though, we are just at the early stage of adopting 4G LTE technology. Case in point is Klang valley, although certain telcos claim to have 4G services in other cities. 4G connectivity is said to be up to 10 times the speed of 3G. It seems like this new gadget is way ahead of our telecommunication infrastructures. And that's it! Nothing to shout about, really. If you are a consumer like me, you will agree that the increase of US$100 (approx. RM300) for a slight tweak is not justified. So that we have some idea of what sort of progression the new iPad went through, I have compiled in the following Table my findings from the internet, mostly from Apple website. 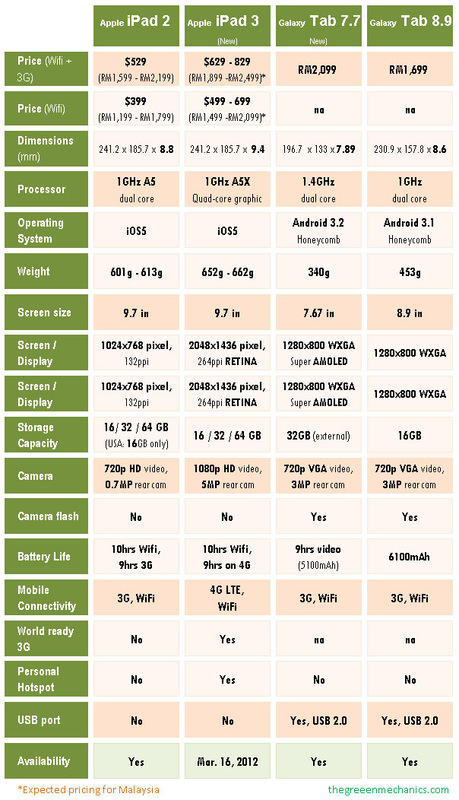 Just for comparison, the new super AMOLED Galaxy Tab 7.7 is pitted side by side, specification-wise, with the new iPad. See which one is worth the money and of course most importantly, better suited to you. Note: The new iPad uses dual-core A5X processor, with quad-core graphics. When our regular phone outlet receives their shipment next week, we'll be checking the Tab7.7 out to fiddle with features. Some say, you have to see it to appreciate the super AMOLED display. Wow now so high-tech till can't really give the proper name of their new ipad...anyway still awesome gadget in the world. Put diehard fans aside, the new Tab7.7 Super AMOLED should give the new iPad a run for the money.